Fantasy Villa is a charming beach house located on the golden sandy beach in Rio Bueno and the most spectacular Bengal Bay. 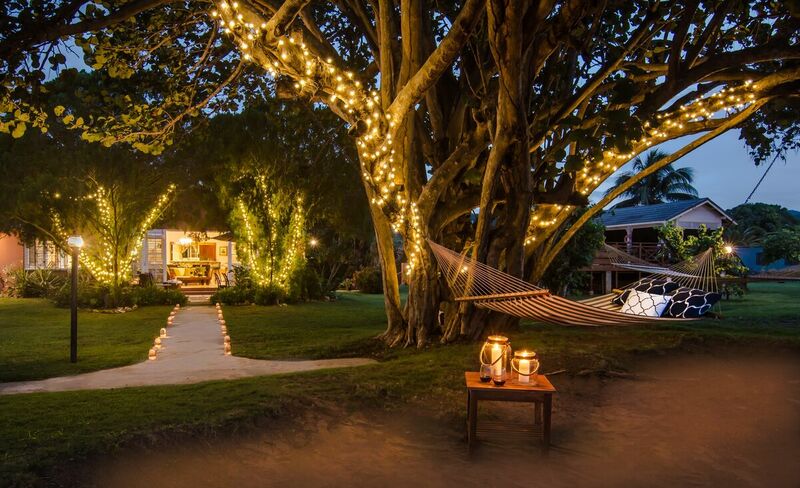 This luxury villa Jamaica ensure a most relaxing Jamaican holiday. 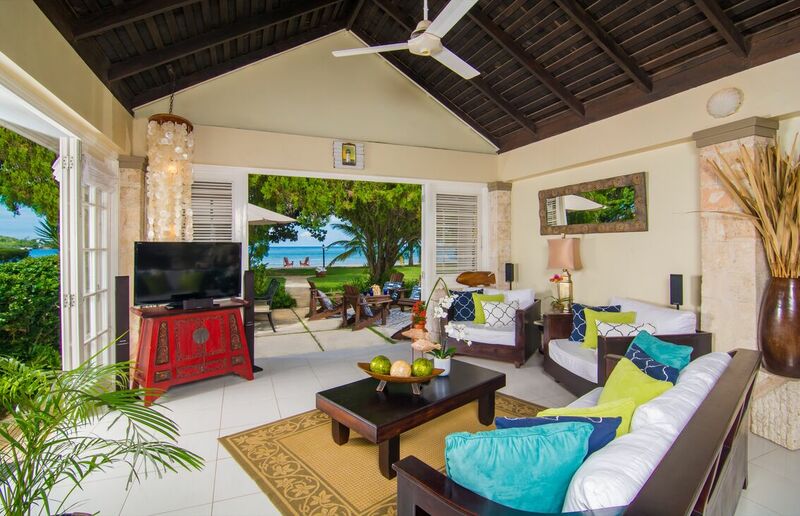 The Jamaica villa, with 3 bedroom and 3 bathrooms is situated in a spectacular and beautiful property, perfect for a relaxing holiday. 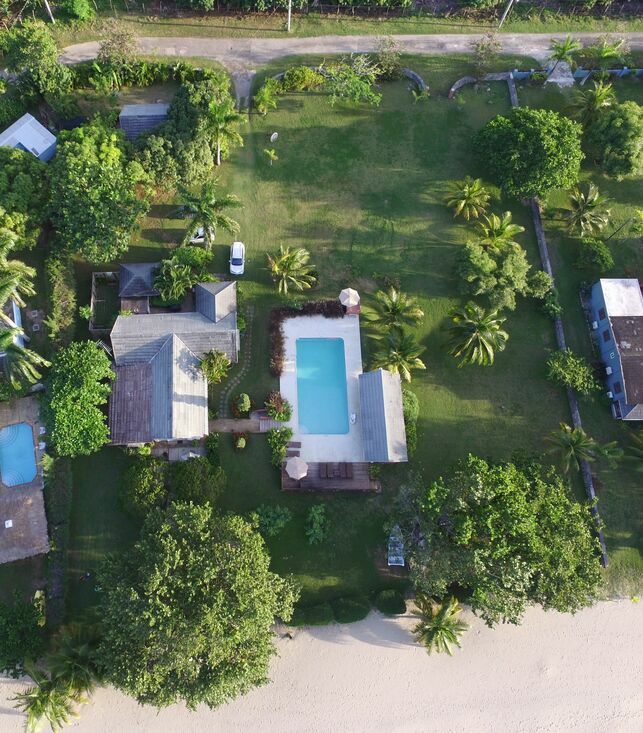 The villa has a large private swimming pool and beautifully landscaped wonderful lawn that offers picturesque views of the glittering Caribbean Sea and surrounding landscape. The owner of Fantasy Villa has taken time to decorate the three bedrooms in a special fashion, which gives each room character. 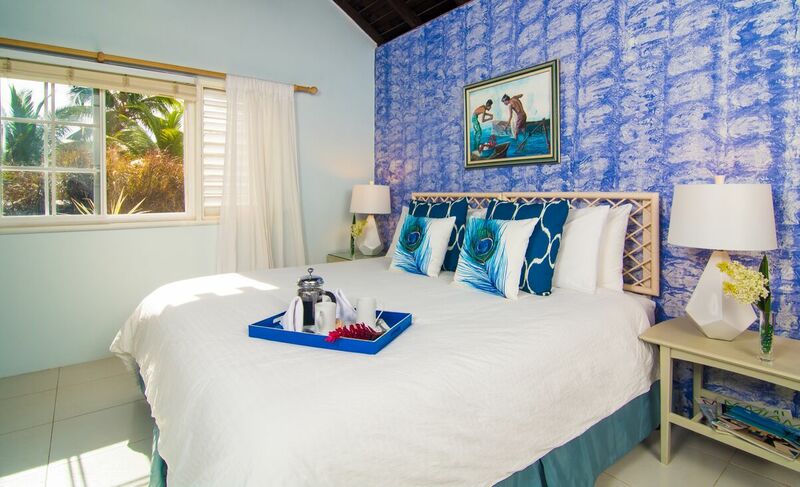 The master bedroom offers air-conditioning, a king-size bed and en suite bathroom with shower and bathtub. 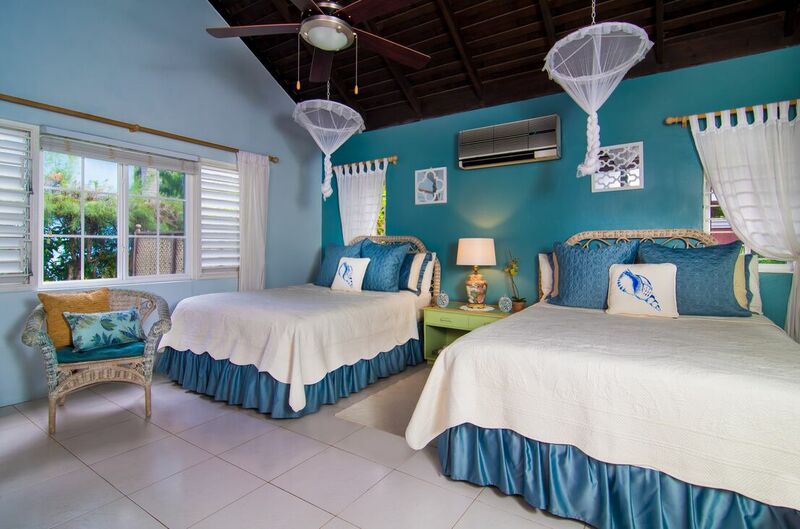 The second bedroom has two double beds, air-conditioning, ceiling fan and wicker furniture. The bathroom is located just outside the bedroom door and has a shower. 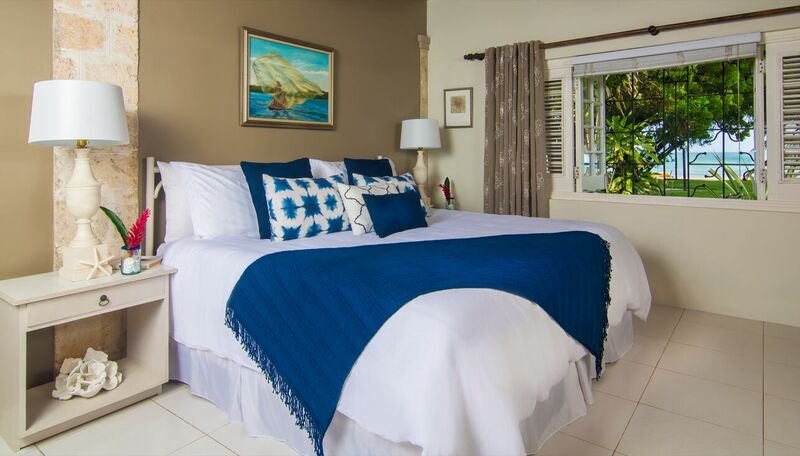 The third bedroom is furnished with a king-size bed that used to be two twins, is air-conditioned with ceiling fans, and has wicker chairs and dressing tables. There is an en suite bathroom with a separate shower. 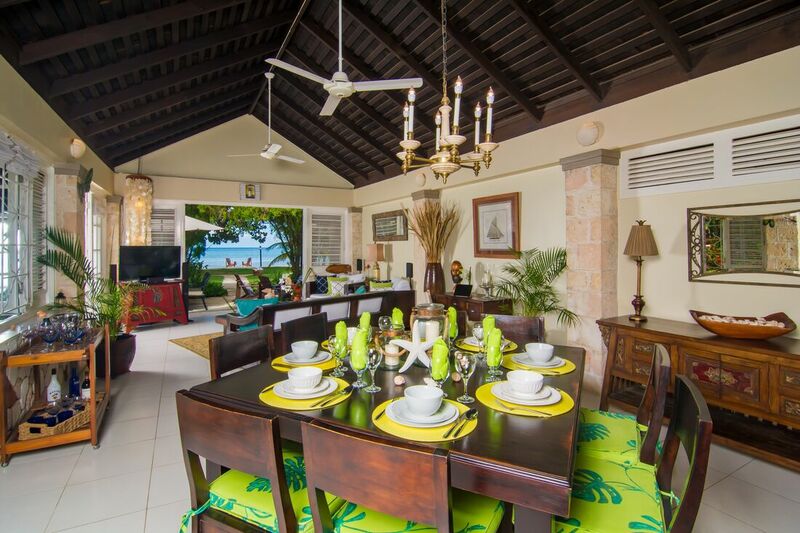 All the windows in this villa feature security grills and insect screens. 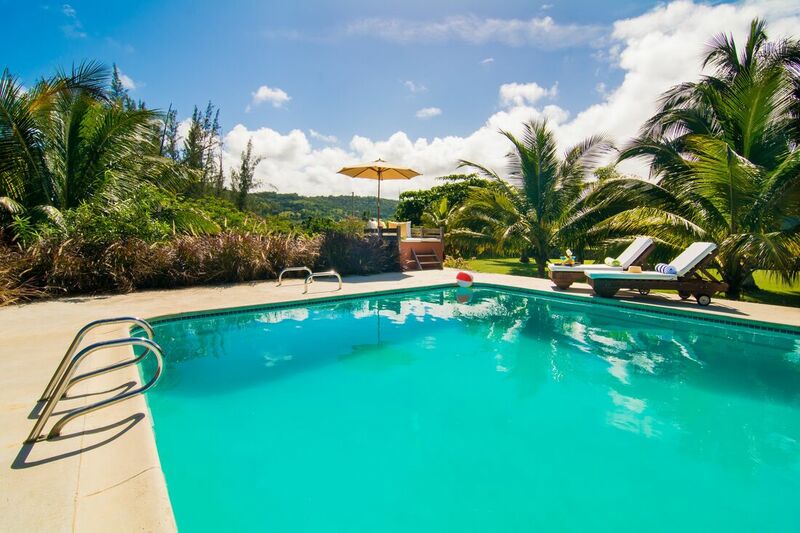 Guests at Fantasy Villa can enjoy their own large private pool and spacious lawn and garden area spread over one acre of private landscaped grounds. 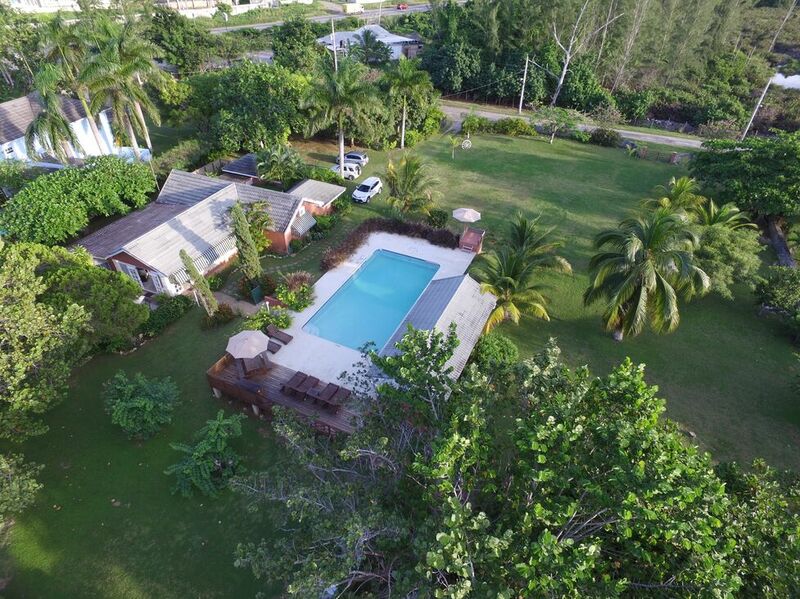 The large swimming pool offers lovely views of the sparkling Caribbean Sea and the rolling hills in the beautiful Rio Bueno area. 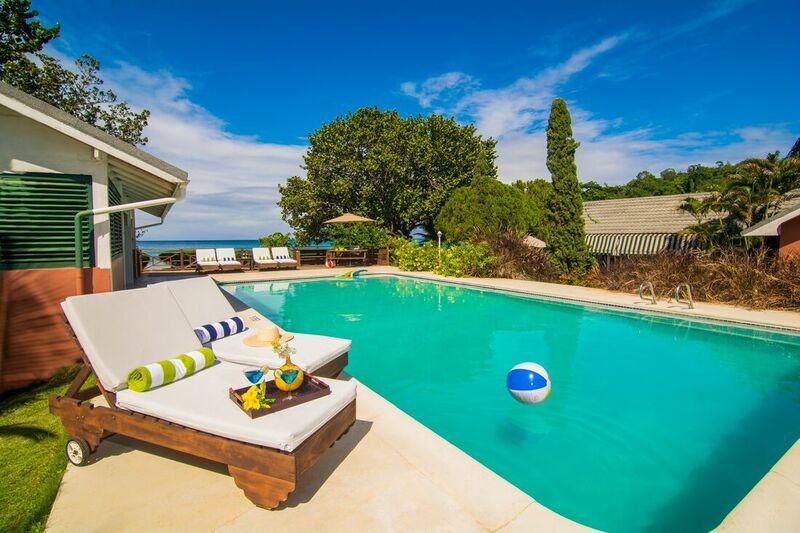 The expansive pool deck is perfect for lazing away, while enjoying the tropical Jamaican sun. 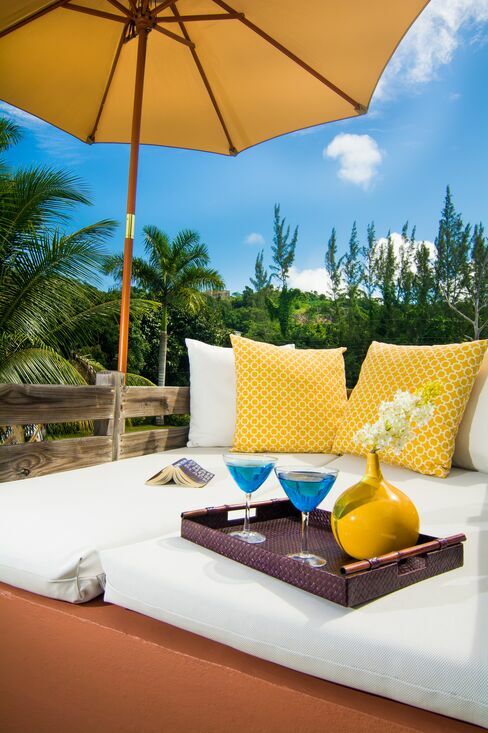 The poolside furniture is perfect for having lunch breaks, or enjoying the sunset with delicious tropical cocktail drinks. 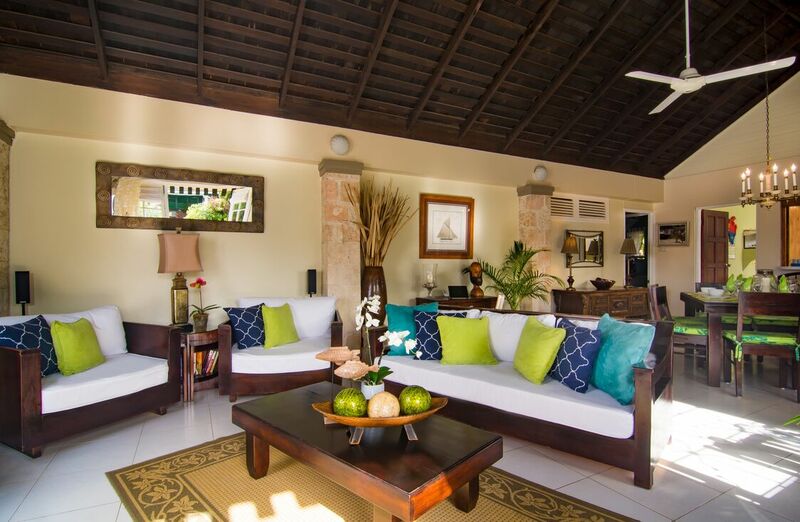 The living areas at Fantasy Villa are very comfortable and open. The newly redecorated living room has lovely tropical colors. The entertainment unit includes a television, DVD player and CD player. 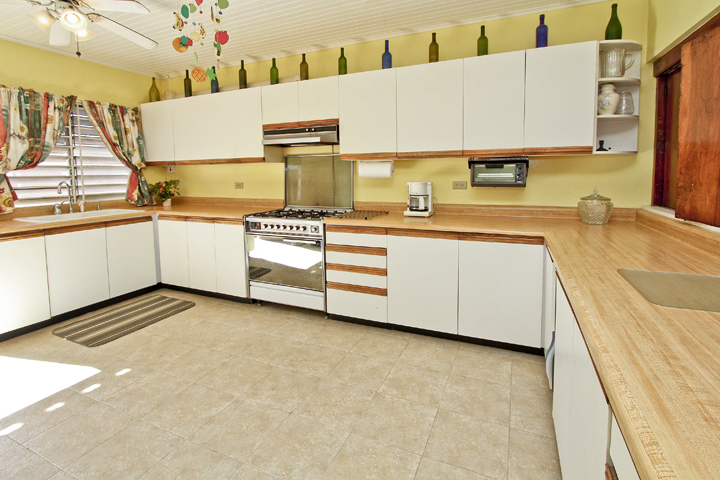 The lovely breakfast bar is perfect for early mornings or late breakfasts, and separates the kitchen from the entertainment area. 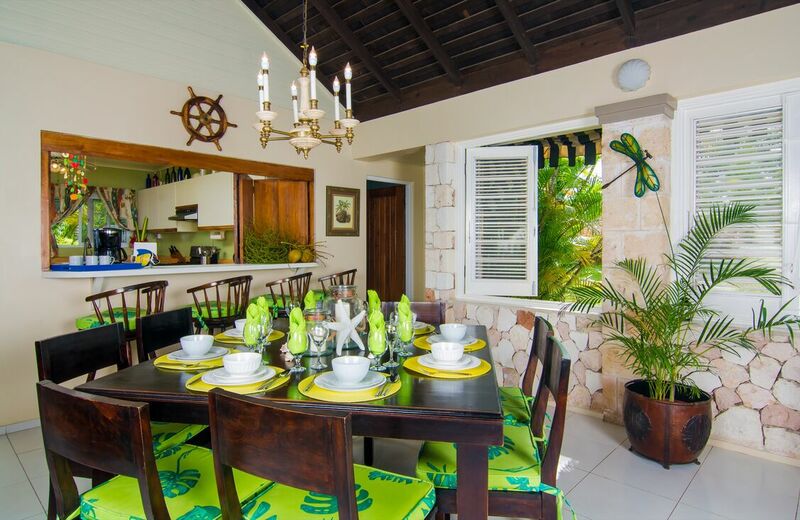 The fabulous dining room offers seating for eight persons, yet is one of many dining options at this villa in Jamaica. 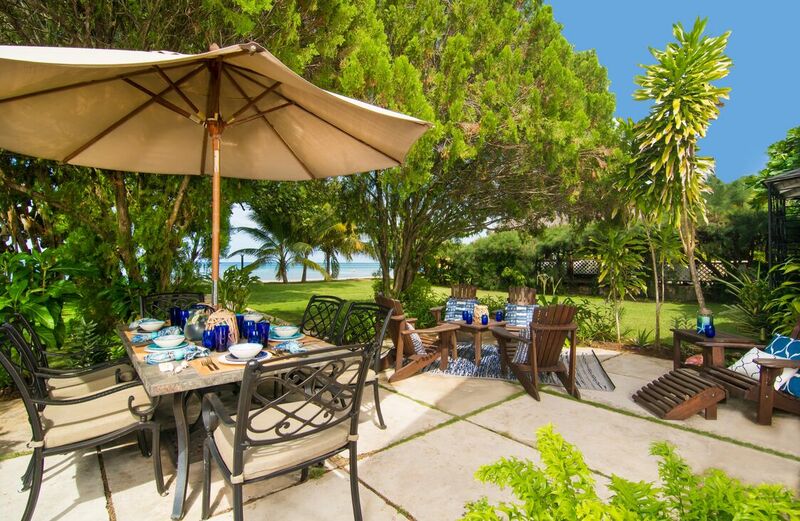 Fantasy Villa is fully staffed with a cook, housekeeper and a resident gardener. 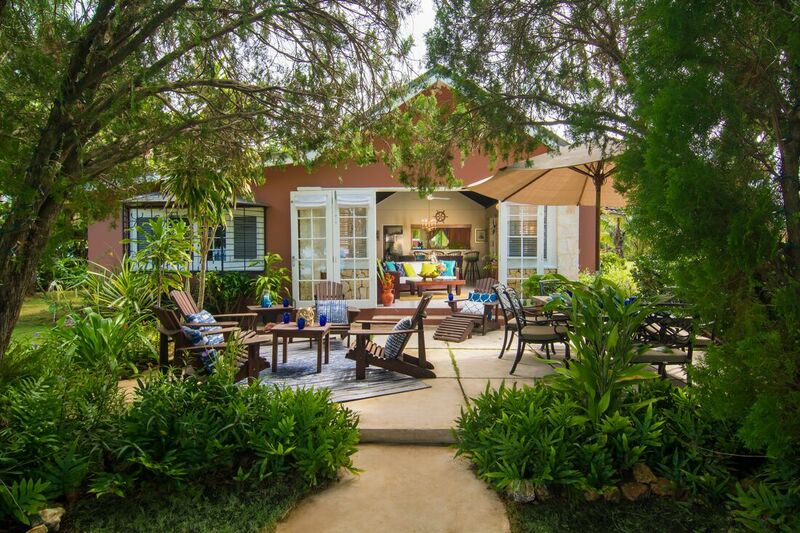 The gardener lives in the staff quarters on the property and is available at all times. 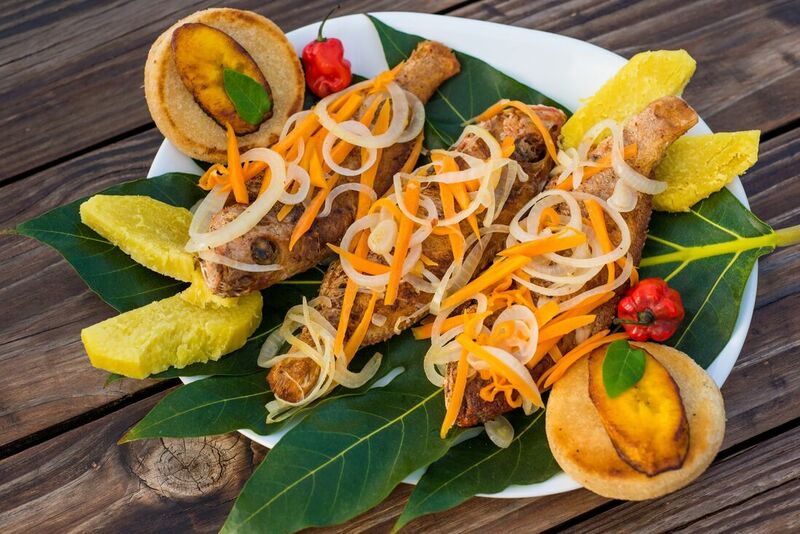 The cook will go to Discovery Bay supermarket to buy the groceries for dinner, lunch and breakfast. Guests may also go with her if they wish or leave it all up to her while they enjoy their holiday! They will simply reimburse her for the groceries bought to prepare the meals. 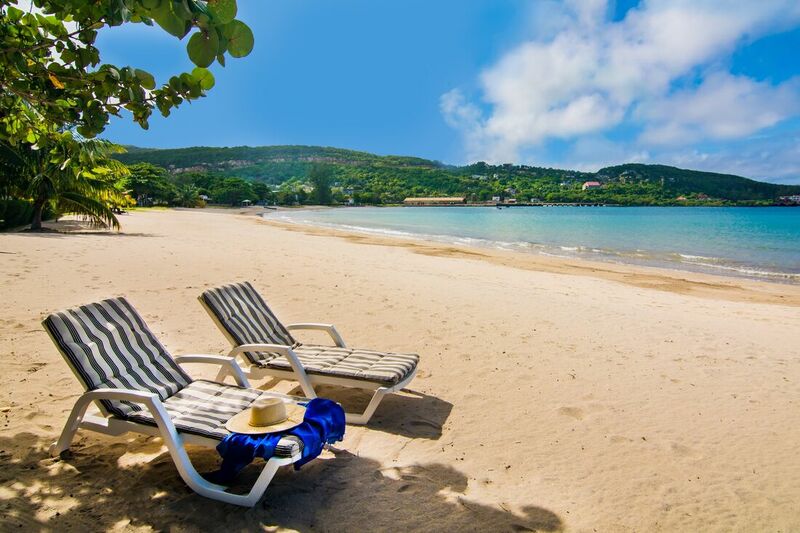 Beach and bath towels and all linen are provided at the villa for the guests’ convenience. 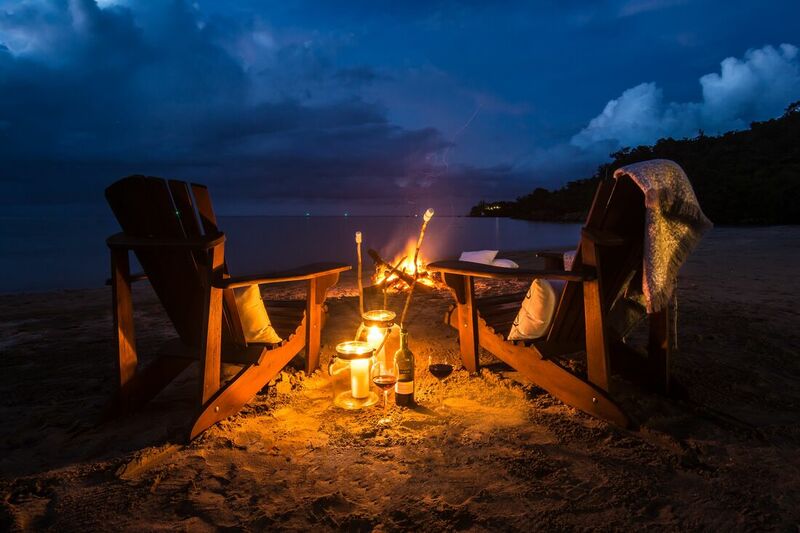 The attractiveness of Fantasy Villa is the convenience of being located just steps away from the water’s edge. 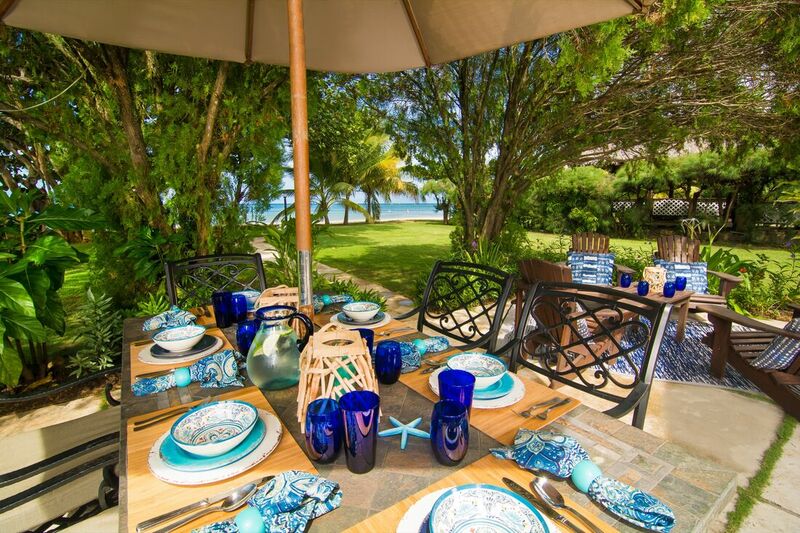 Guests can take advantage of the well-tended gardens, which offer tropical beauty and privacy in this lovely neighbourhood. 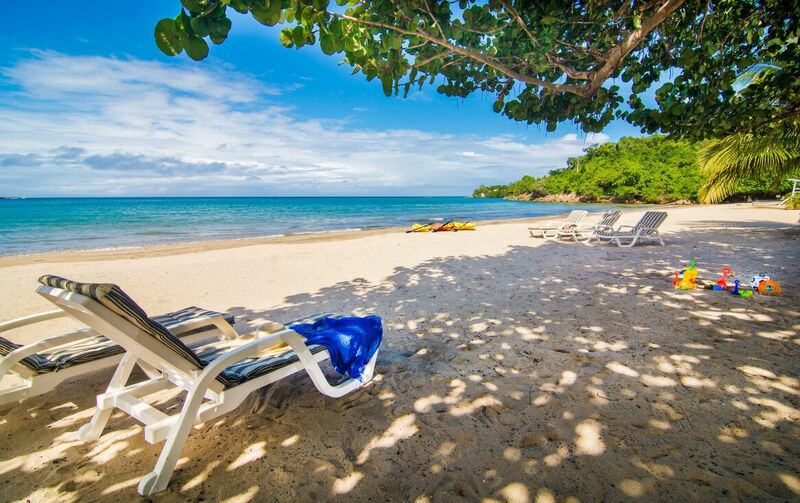 This villa rental in Jamaica is away from the tourist areas and is located between two other private homes, so there are no crowds. 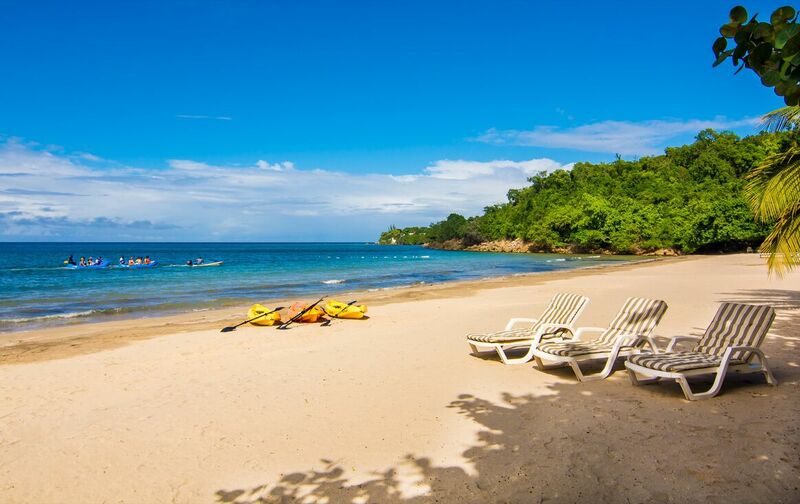 Sea kayaks are available to thoroughly enjoy the beachfront property! For a 6 bedroom option, guests can rent Fantasy Villa (3 bedrooms) and Beachnut Villa (3 bedrooms) for a total of 6 bedrooms! These are sister villas sharing the same swimming pool, both villas are beachfront. Sea Kayaks available. Beachnut is a 4 Br and Fantasy is a 3 Br. Fantasy is more suited for wedding however Beachnut can work. The ceremony would have to take place on the beach and the reception would probably have to take place on the beach as well. 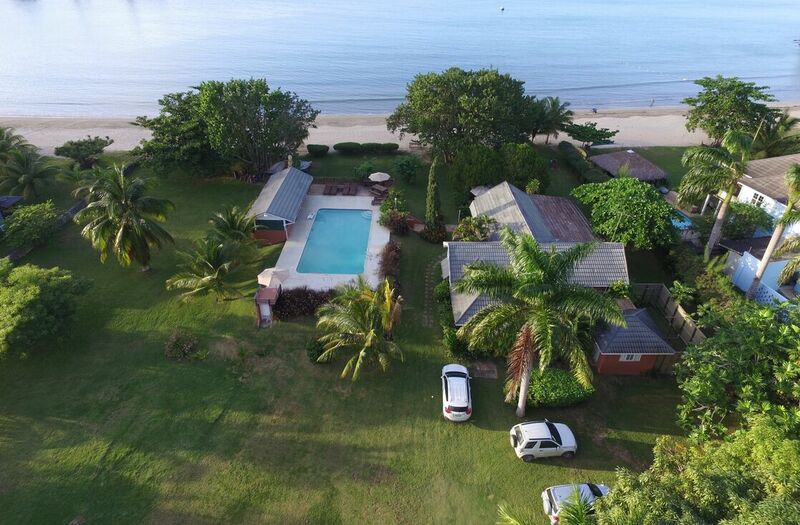 We installed a pool in Beachnut last year so there isn't any yard space between the villa and the beach anymore. However we do have lawn space between the villa and the road. Fantasy can sleep 8 people comfortably with 2 persons to a bed. Plus with 2 people sleeping in the air mattress Fantasy can sleep 10 people. 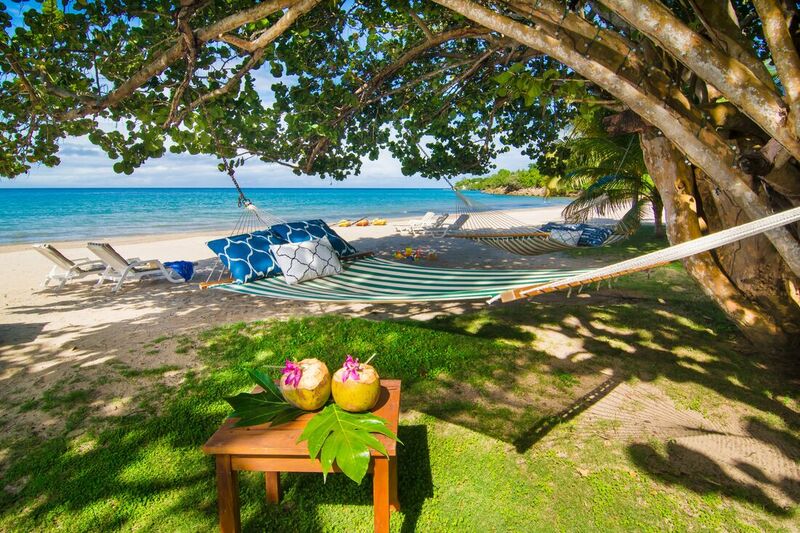 Fantasy has the perfect spot with the beach in the back ground for the ceremony. 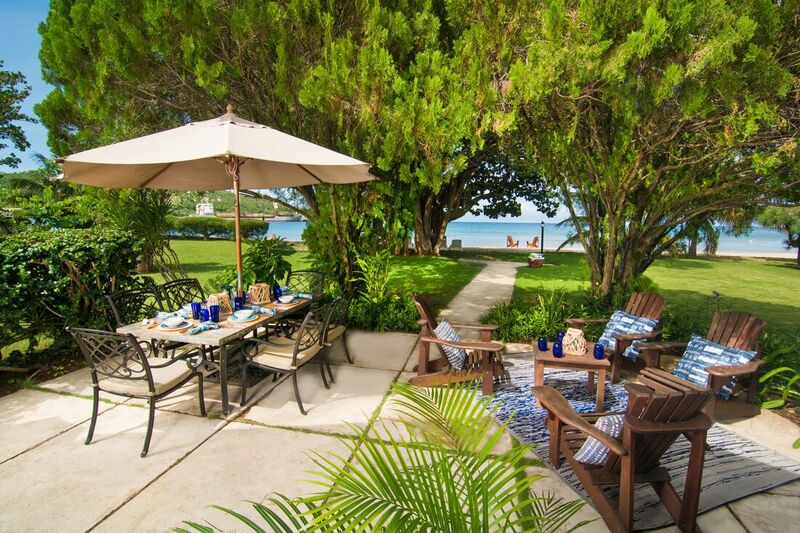 It also has a huge lawn space by the beach for receptions. 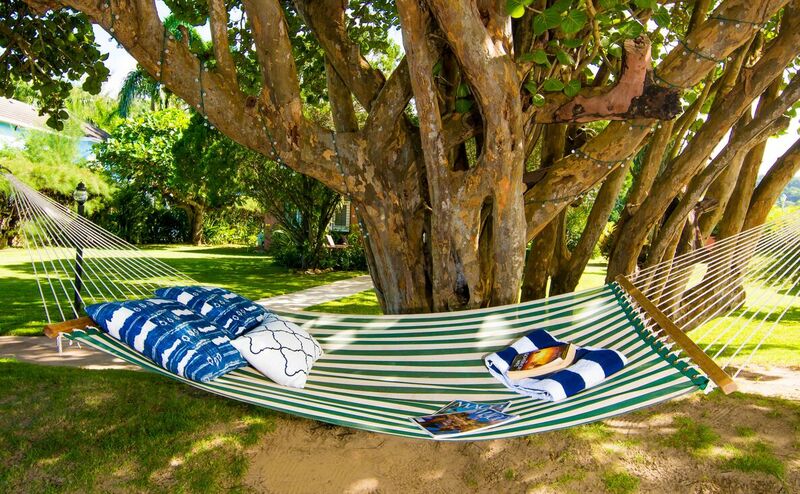 If the wedding is being held over Fantasy cloth barrier will need to be put up between Fantasy and Beachnut (please refer to the picture below). Having the tent is really up to the wedding planners. A portable toilet is mandatory because our outside toilet cannot handle that crowd and wedding guests are not allowed inside the villas during the wedding. 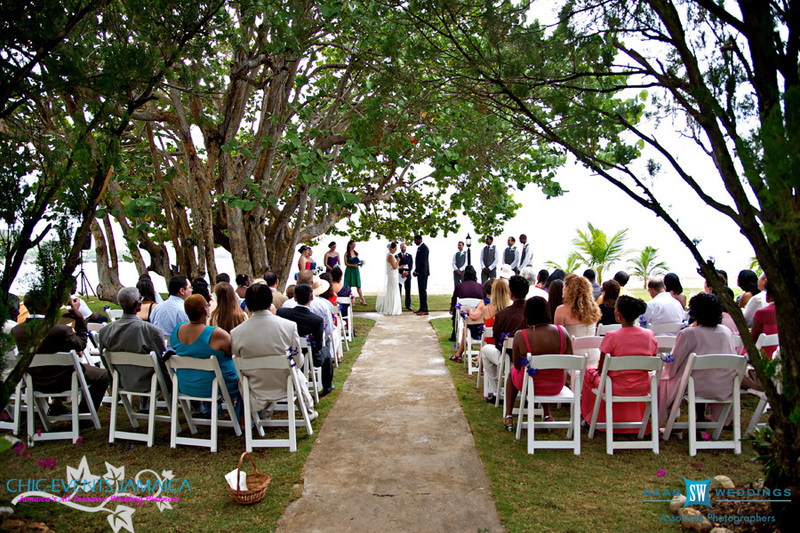 Only the outside grounds of Fantasy and Beachnut are to be used as the wedding Venue. 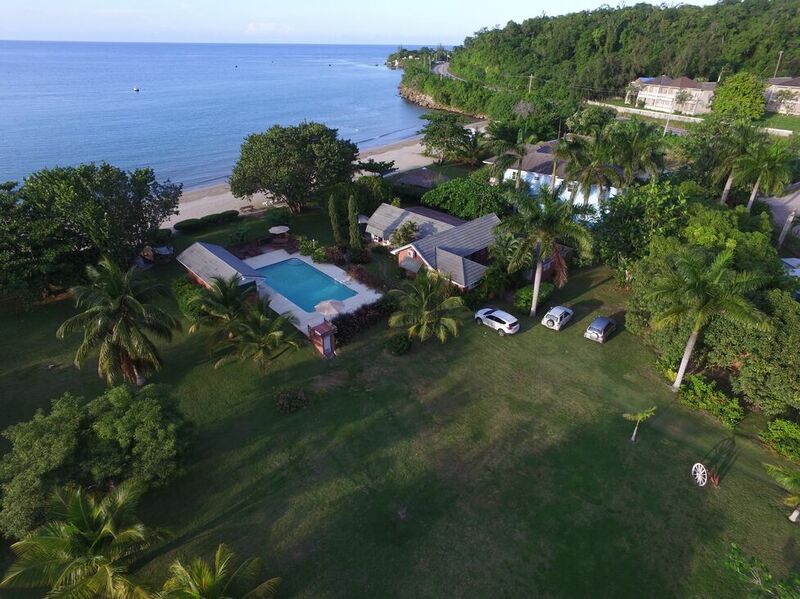 During the wedding only guests being accommodated at the villa, persons apart of the wedding party, and persons involved in grooming/photographing the bridal party are allowed to enter the indoor premises of Fantasy and Beachnut. Nothing from inside the villa must be used for the wedding. Our staff members are not required to work for the wedding. The wedding planner is the one responsible for provide staff to cater to and work at the wedding. A portable toilet is required to rented for event.